I posted a little while ago a question about my basil. It is growing great now that it's in potting soil with some compost/soil mix. I have it in a planter outside and it has tripled in size in a week. Very nice, how long until it can be used or is it ready now? From what I have been told I could have used it as soon as it got its true leaves. I did not though cause I did not want to shock it at all. But she is technically ready to go now. 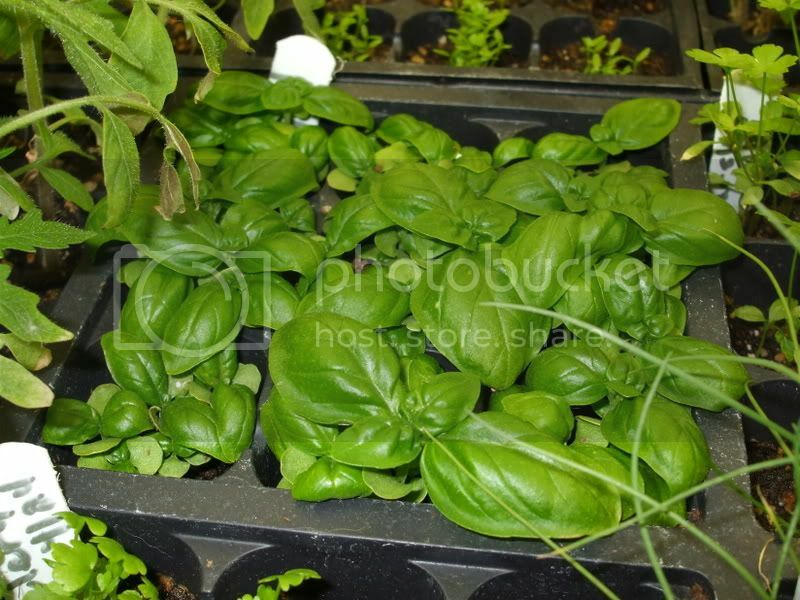 Basil is one of those plants, the more you use the more the plant grows. If you are not using the plant fast enough, IMO it is still good to go out and pinch the top growth, which encourages lateral growth. This is especially important when the plant starts sending up flower spikes. Pinch them unless you want a plant to make seed for saving. This time of the year try a slice of fresh mozzarella topped with a slice home grown tomato, topped with fresh basil, drizzle with good quality olive oil, add fresh ground black pepper, sea salt, and perhaps some greek seasoning (optional). Ah, what a great summer snack. 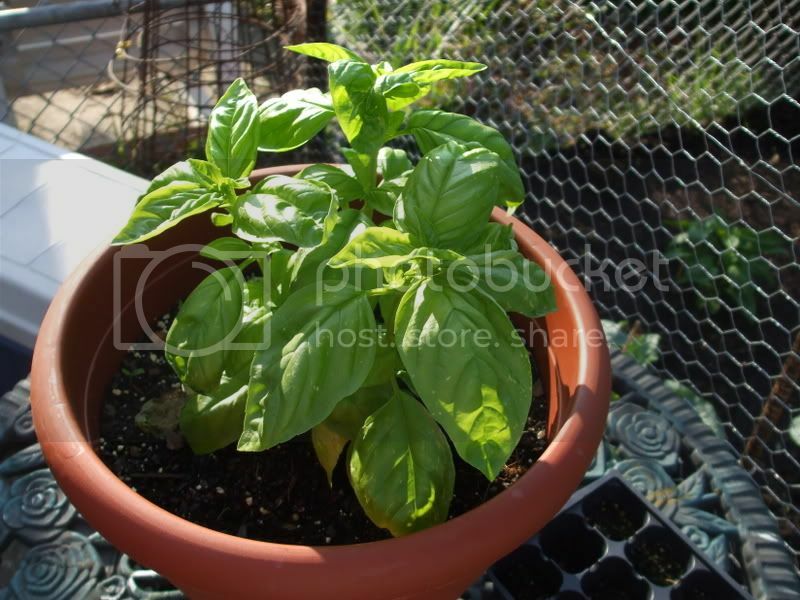 I'm growing basil and yet a photo of it makes me want to drool. What's that, Pavlov's law? I'm going to have to make some eggs with basil in the morning I think. And pick some herbs for tea. That makes me hungry for tomato, basil and mozzarella. I make this all the time for guests and myself. I actually make a balsamic reduction to go along with it. Just a little goes along way and makes quite the difference. How bout that recipe for the balsamic vinegar reduction!!! Just take a pot and balsamic vinegar, you will want to add twice as much vinegar as you want to end up with. If you need 1 cup of balsamic reduction then do two cups but it will probably be much less as it is very strong. I add a little sugar to mine to sweeten it up a touch and I don't measure but really to taste. You essentially just let the vinegar and sugar (if you use it) simmer and it will evaporate water leaving a thicker reduced powerful sauce.